Just retired three months ago. Home is the Folsom area. Getting back to hunting after a 29 year hiatus. Have always done a little plinking with handguns. Attached a complete 300 blackout upper to my Colt HBAR lower, in order to do some hog and deer hunting. Presently am trying to gather information about reloading for adequate knock-down power. Any information about bullet type and weight, powder loads, and reloading suggestions would be greatly appreciated. 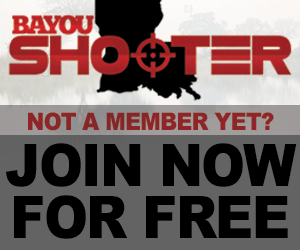 Just happened to see the BayouShooter web page while searching the web. Thought the group's input would be beneficial to my reloading education. Thanks in advance. Welcome from Lake Charles and good luck!!!! I'm more of a Beeman guy, but welcome from Breaux Bridge ! Last edited by Beau Etienne; January 23rd, 2019 at 09:20 PM.